December 8, 1935 - "Yes, business is much greater than before March 1933!" Landis spoke during a time where administrative law predominated. But early securities law developed through court decisions in reaction to an intricate mix of complaints from investors and the general public about market abuses. The nation’s courts, in the context of the federal system, played an instrumental role in the interpretation of securities legislation and administrative implementation. In the early 1900s, that legislation came mostly from the states, which passed laws regulating securities and the markets. 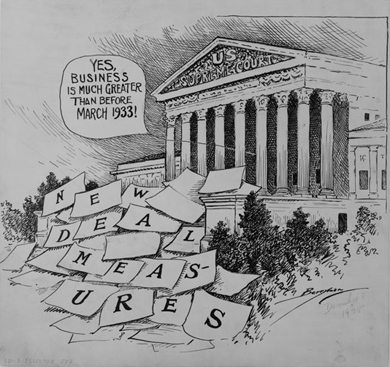 After the stock market crash of 1929, as the regulation of securities became more complex with the passage of the Securities Acts of the New Deal, the newly-established U.S. Securities and Exchange Commission began to interpret the laws, create and implement rules, and develop legal strategies to regulate the securities industry. The SEC’s legal strategies sought to implement Congressional intent and its own independent regulatory philosophy. SEC lawyers found themselves facing fundamental questions relating to the regulation of the nation’s growing and complex economy. What were the appropriate limits of Congressional power to regulate the markets in the federal system? What was the role and power of the newly-created administrative agency to regulate securities markets and actions? What could the SEC do when the laws passed by Congress were ambiguous or uncertain? And, since the courts were the final arbiters of every controversy, each decision and rule formulated by the SEC posed the ultimate question: what would the courts say? The story of the development of securities law necessarily involves the written decisions of the courts, but to focus on merely those decisions, those final parchments where the courts give their official opinions and reasoning, ignores much of the story. The context of the case and the decision, the manner by which a case came to be heard by a court, the strategic decisions made by the SEC General Counsel’s Office and appellate legal counsel, the personality of the justices and the court hearing the case, and the legal and economic philosophies of the court all play a part in a court’s decision. Only by considering those factors can the development of securities law as an essential part of our economic history be fully understood and appreciated. (1) Investment Bankers Association Annual Proceedings (IBA Publications: New York, 1936), p. 193. (2) Michael Parrish, Securities Regulation and the New Deal (Yale University Press: New Haven, 1970), 181-182.